Recently, it somehow made big news that teenage pop star Miley Cyrus removed her hair extensions. Photos began floating around the internet with her new, cropped ‘do. “Miley is said to have flown the extensions in from Italy to New York to hairstylist Kristina Barricelli at the uber expensive salon Gemini 14.” Her hair dresser was then flown to LA where she actually put in the new extensions for the 17-year-old. I mean I know she’s reportedly well on her way to hitting the billionaire mark, but there are still a million better ways to spend 24 grand — what do you think? Since moving to L.A., I’ve visited numerous salons and beauty supply stores that have waxed poetic about Moroccanoil (yes, it is spelled correctly). I figured the excitement over this line was just the result of overzealous salespeople, and since I bolt at the first sign of a sales pitch, I’ve ignored much of the hype — that is, until now. Desperate times call for desperate measures, and thanks to my last dye job, now is one of those times. But before I decided to try anything new on my hair, I asked my friend Tiffany — who is notoriously difficult to please when it comes to haircare — if she has heard of the line. In the 13 years I’ve known Tiff, she has repeatedly shot down any products I’ve brought up, saying that nothing works to calm her dry, course hair. So naturally, I was stunned that she formed the exact same twinkle in her eyes as all of those overzealous salespeople. According to Tiff — who raves about Moroccanoil’s Intense Curl Cream — the product gives hair enough moisture to deliver a “soft, and natural feel,” but is light enough so the curl isn’t weighed down or straightened. After witnessing her excitement, I decided to give the line a go. I experimented with both of their masks–the Intense Hydrating Mask and the Restorative Hair Mask–and I found that, for my current dry hair situation, the Intense Hydrating Mask is exactly what I need. It has a thick and creamy texture, but washes away without leaving an oily residue. The secret to this line is probably the quality of ingredients–which features Shy’s beloved argan oil. You can always tell when a company uses high or low quality ingredients, because with poor quality, your hair ends up having a dull, waxy film on it. With Moroccanoil’s products, I found that everything–from the Moisture Repair Shampoo to the Hydrating Styling Cream–absorbed and left my hair with a soft, pretty sheen. The treatment oil can actually be mixed with any of the styling products to amp up shine or calm down frizz. The Restorative Hair Mask will be the perfect conditioner for my hair when it is healthy, but dry; for now, the Intense Hydrating Mask is exactly what my dead, lifeless hair needs to look healthy. The Glimmer Shine Spray, like the rest of Moroccanoil’s products, smells sweet and yummy. Plus, it delivers a lightweight shimmer along with daily UV protection to prevent further damage. 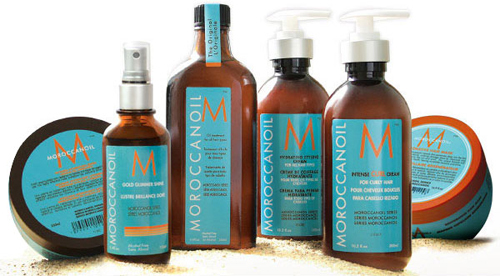 I now get why so many people rant and rave about Moroccanoil’s products. I’ve also learned how to distinguish a sales pitch from genuine product obsession…it’s either in the twinkle of the eye or the sheen of the hair. For more on Moroccanoil products, visit their website at www.moroccanoil.com. 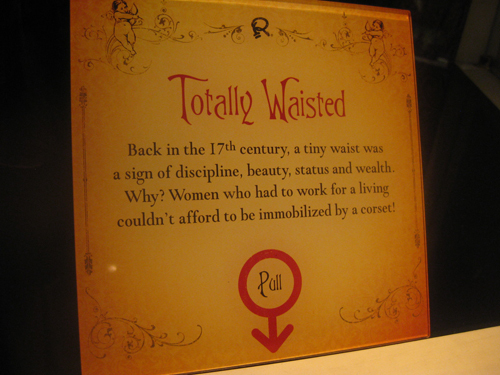 Queen Catherine de Medici of France declared that the ideal waist was just 13″! During the 1550’s, she banned thick midriffs from her court and unwittingly launched the corset craze – a gut-crushing trend that would define and confine fashionable women for the next 350 years. A 23-year-old beauty with a tiny waist was the envy of the party — but two days later she inexplicably died. An autopsy revealed 3 broken ribs and a punctured liver. The killer? Her over-tightened corset. 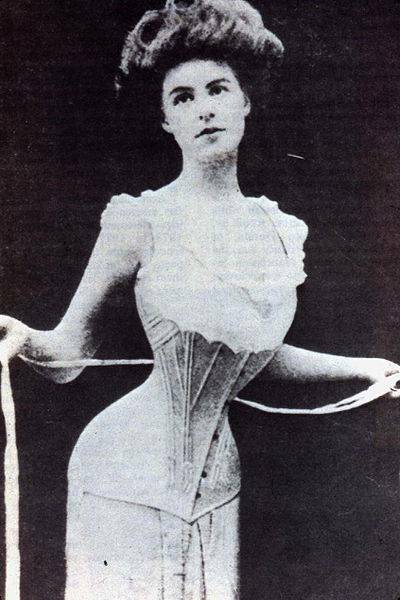 In the corset’s heyday, mysterious deaths of fashionable women were sometimes explained by autopsies that revealed stomachs nearly cut in two! 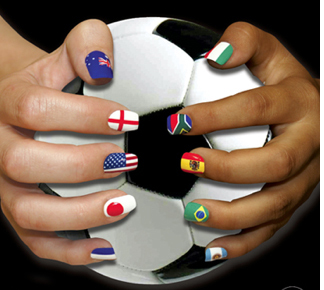 If you’ve been keeping up with the World Cup, and really want to show your team spirit hit up a salon offering Minx — they’re offering your team’s flag for your nails! Go to their website to see more designs (thanks Sabrina for the tip!). 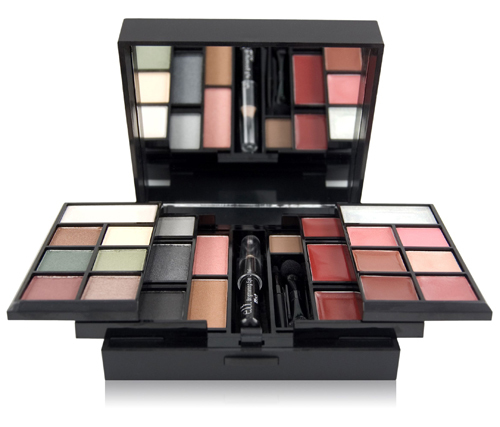 E.L.F.’s Two Million Contest PLUS Mini Makeup Palette giveaway! –Makeover provided by Achelle Dunaway, the Creative Director and lead makeup artist for e.l.f. e.l.f. lovers can win prizes with the Submit Your Look contest. Just upload a photo of your favorite e.l.f. makeup look for the chance to win a $500 cash prize. Every submitted look will be voted on by fellow customers and peers through eyeslipsface.com, facebook and twitter. In addition to the cash prize, the winning look will also be featured on the e.l.f. website for six months. The winning look will be created into an e.l.f. makeup set, which will be awarded to the first 100 customers on the day of the 2 millionth order. One BATF reader will win the beauty brand’s Mini Makeup Palette, which is a 27-piece set that holds 9 eyeshadow shades, 1 cream eyeshadow shade, 1 blush, 1 bronzer, 10 lip gloss shades, 1 brow powder, 1 eye liner pencil, 1 dual ended eyeshadow applicator and brush, 1 face brush and 1 lip brush. Simply leave a comment below to enter. To double your chances, get on Twitter and tweet “RT @BeautyNDFeast Win an e.l.f. mini makeup palette http://ow.ly/24d0N”. Winner we be announced July 5th! Good luck! My style is: FATIMA: Easy going. I love looking fashionable, but it shouldn’t be hard work. NYLA: modern, chic and uncomplicated. Designers I love: FATIMA: Devi Kroell…although I’m devastated she’s not designing for her namesake anymore. NYLA: Devi Kroell (we definitely can relate to her aesthetic), Prabal Gurung, and Proenza Schouler are my favs at the moment. People usually compliment my: FATIMA: eyes. They’re a weird color and change with whatever I’m wearing. Instant accessories ;). NYLA: style. I’ll never forget the time: FATIMA: I met Milo Ventimiglia at New York Comic-Con! It’s no secret that I’m a big nerd. He was there introducing a new comic book project he was working on, and I found a new hero. My husband has come to terms with this. NYLA: The first time I was invited to fashion week to see the Oscar de la Renta show. It was amazing! For my skin, I love to use: FATIMA: I use a combo of Clinique and Olay products. I swear by Clinique’s All About Eyes cream. I’ve seen a huge difference since I’ve started using it. NYLA: Clinique’s All About Eyes. My favorite makeup tip: FATIMA: Lip stain! It’s perfect for that no-make up look and just freshens you up. NYLA: clear mascara on eyebrows– keeps them in place, because my eyebrows get a little crazy sometimes. Current beauty product obsession: FATIMA: My LORAC liquid eyeliner pen. It’s so easy to use I wear it almost everyday. NYLA: Lancome Artliner— the best liquid liner, it’s like a felt tip market and goes on so smoothly. My favorite scent right now is: FATIMA: I’ve been using Chanel Coco Mademoiselle for a while now and it’s my go-to scent. It’s very fresh and is a much younger scent than Chanel No. 5. NYLA: I’m obsessed with D&G’s 3 L’Imperatrice. People might be surprised to know: FATIMA: That I’m a second degree black belt in Shaolin Kempo Karate. NYLA: My friends and I (including Fatima) are working on a comic book project together about South Asian American superheroes. My favorite product for my hair is: FATIMA: Bumble and Bumble Styling Balm. Even my husband’s noticed a difference! NYLA: Bumble and Bumble Surf Spray— it gives texture to my hair when it’s all flat.. Love! I don’t understand people who don’t like: FATIMA: peanut butter and banana anything! Sandwiches, smoothies, etc. NYLA: the combo- peanut butter and chocolate – it is THE best. The restaurant I can never get tired of is: FATIMA: Noodle Bar in the West Village. I can NEVER get sick of this place! If you go there you have to order the Singapore Noodles (I usually order the veggie version because I love bok choy) and make sure you bring your appetite. It’s gotten to the point where this is the only thing I’ll order. It’s seriously comfort food. NYLA: Bare Burger in Astoria– it has the best burgers. I get something different every time and I love every meal as much as I loved the last meal I had there. They have ostrich, elk, lamb, buffalo, and beef burgers. AND to top it off — peanut butter and chocolate milkshakes! Though I can make a mean: FATIMA: pot of chili. It’s seriously the only thing you’ll want to eat! NYLA: cookies, I make some awesome homemade chocolate chip cookies. What inspires me: FATIMA: Our customers. Really. We’ve received some really inspirational letters from fans and customers who are just so excited that there is a company out there providing women with exactly what they’ve been waiting for. NYLA: at the moment- Morocco, after a trip there, the culture, textiles, color and architecture has been very inspiring.